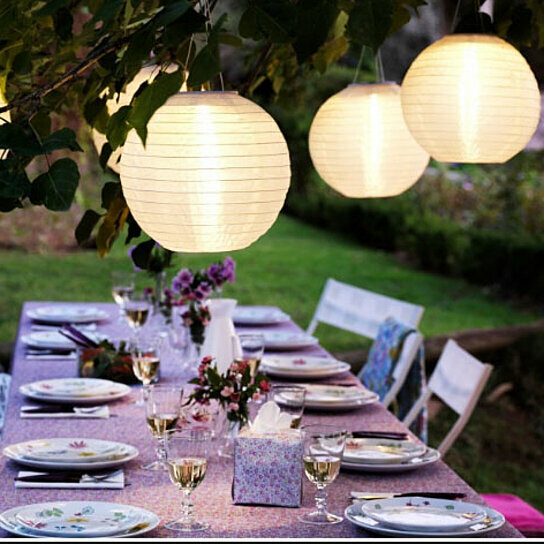 Bring a warm, romantic and dreamy ambiance to your outdoor lighting with these decorative Solar LED Chinese Lanterns. Made from waterproof nylon and powered by the sun, these lanterns can weather all season climates. The spectrum of fun colors will accentuate your outdoors during the nights with their warm glow and brighten your garden with joy during the day. Automatically charges during the day and turns on at night. Convenience on/off button is also on the lantern to control light manually. Great for outdoor use, adds color and light to your garden or patio for evening parties. Fast and easy and to install, simply hang your lantern by the hook at the top.. The solar light can work up to 10 hours after fully charged.